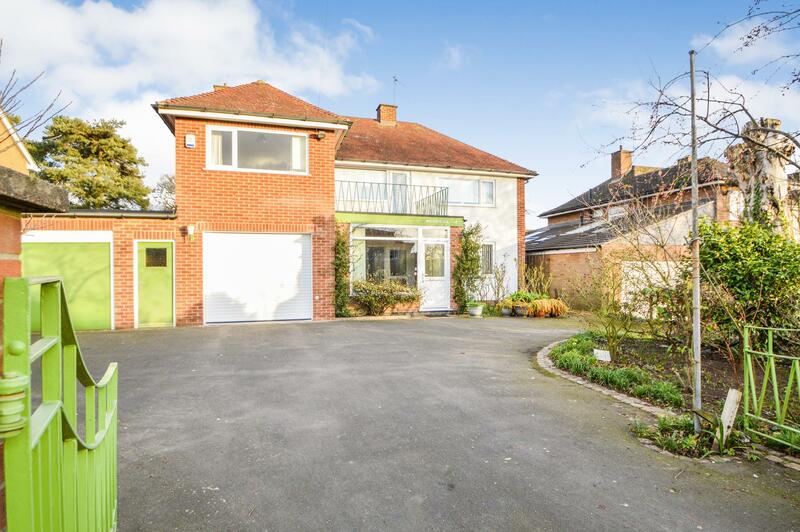 Benjamins are delighted to present this spacious detached family home which is situated in the highly regarded South Nottinghamshire village of Keyworth. 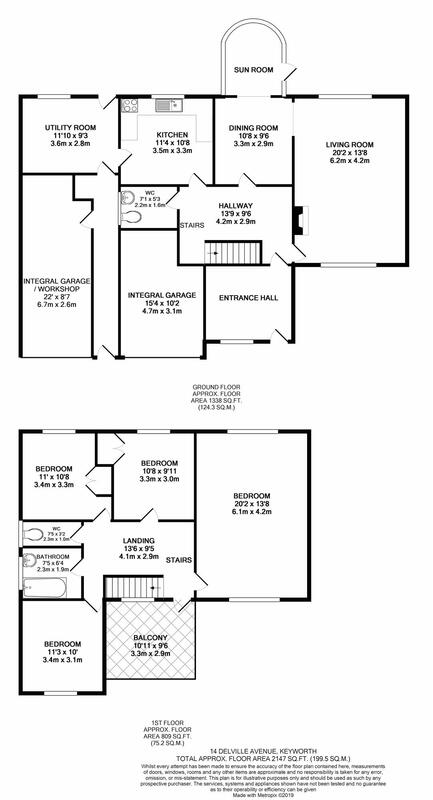 This generous property offers a great deal of potential with accommodation arranged over two floors which includes a large entrance porch, entrance hall, living room, kitchen, utility room, dining room, sun room and wc to the ground floor, with the first floor landing giving access to four bedrooms, bathroom, separate wc and access to a balcony. Benefiting from gas central heating and double glazing, the property enjoys a good size garden to the rear, with a generous driveway to the front and two integral garages provide ample off road parking. An internal inspection is highly recommended to appreciate this opportunity. With upvc double glazed entrance door and side panels, ceramic tiled flooring and further upvc double glazed door to the entrance hallway. With window to the side aspect, ceiling light fitting, ceramic flooring, wash hand basin and wc. With original parquet flooring, radiator, wall mounted electric heater, coving to ceiling, wall light fittings and access to the sun room. Upvc construction with doors to the rear garden, ceramic tiled flooring and radiator. With upvc double glazed window to the rear aspect. Fitted with a range of wall and base units with work surfaces over. Radiator, double electric oven and gas hob, single drainer sink unit, wall mounted chrome electric towel rail, glazed serving hatch and door to the utility room. With upvc double glazed window to the rear aspect. Belfast style sink, built in cupboards and drawers, window to the front aspect, plumbing for washing machine, wall mounted central heating boiler, upvc double glazed door to the rear garden and further door giving access to the garage/workshop and the front of the property. A particularly light and spacious area , with upvc double glazed window to the front aspect, carpet to flooring, radiator, upvc double glazed door leading onto the balcony giving pleasant views to the front of the property. Doors to the first floor rooms. With upvc double glazed windows to both the front and rear aspects. Two radiators, ceiling light fitting and carpet to flooring. With upvc double window to the rear aspect. Built in wardrobe with cupboards above, carpet to flooring, radiator and ceiling light fitting. With upvc double glazed window to the front aspect. Radiator, carpet to flooring and ceiling light fitting. With upvc double glazed window to the rear aspect. Built in wardrobe with cupboards above, radiator and ceiling light fitting. With upvc double glazed window to the side aspect. Fitted with a coloured suite to include panelled bath with shower over and wash hand basin. Tiling to walls and floor, Victorian style radiator and chrome wall mounted electric towel rail, built in cupboard with shelving, ceiling light. With upvc double glazed window to the side aspect. WC, tiled flooring and ceiling light fitting. To the front of the property there are planted shaped borders, external lighting, and a good size tarmac driveway leads to the front porch and gives access to the garages and integral passageway. There is pedestrian access to the side of the property leading to the rear garden. To the rear there is a good sized garden with lawn area, paved patio, a garden pond and well planted borders with a large variety of mature tress and shrubs. There is a separate area to the rear of the plot which would be ideal as a vegetable plot. With light and power and courtesy door to the integral passageway. With electric up and over door. Light and power and housing utility meters. The local authority Rushcliffe Borough Council has advised us that the property is in council tax band F, which we are advised, currently incurs a charge of £2,734.67 (2018/19) Prospective purchasers are advised to confirm this.